The English in Action program matches English-speaking community volunteers with Stanford international graduate students, visiting scholars, post-doctorates, or spouses. 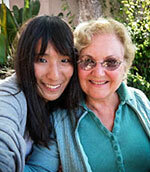 Partners meet weekly for casual conversation and cultural exchange. The EIA program accepts applications from internationals from August to the end of April. Registration will be closed from April 30, 2019 to August 1, 2019. We look forward to assisting you in August. After you have completed and submitted your application, an EIA representative will contact you to schedule a brief interview. We will take into account your speaking skills and interests. You will receive an interview/orientation only when a volunteer becomes available. It may result in a wait for a partner. This program provides volunteers and internationals with the opportunity of meeting once a week for an hour to practice English and develop a friendship. Each academic year, we expect nearly 300 EIA applications from internationals for a one-year conversational partner.